After a long and arduous eight-year battle, the City of Long Beach has formally acquired the Army-owned property at 3800 E Willow St., known as Schroeder Hall, with the title to the property handed over in a ceremony held last Friday. The property is to become a new Eastside police substation given the current East Division Substation on Los Coyotes is undersized and outdated. Last year, the possibilities of what the property would become brought out fears of the homeless wandering the neighborhood after the federal government told the City that, should the property be handed over, part of the space must be turned into a 9-to-5 homeless/mental health facility. The Grand Avenue and Willow Street space and was offered to the city by the U.S. Army as “surplus property” in 2006. Given its surplus designation, certain rules have to be followed via the McKinney Act signed by President Ronald Reagan in 1987–particularly Title V, which mandates that surplus federal properties must also provide a facility that caters to the homeless via a nonprofit in addition to its use by state and local governments. Initially, the local use was to be a new East Division police substation that is needed for the area while the nonprofit would be Mental Health America, which caters to the mentally ill homeless in which the city felt would best be housed in a one-acre site directly across from Schroeder Hall. This proposal stirred up the ire of residents in the Stearns Park neighborhood, the residence nearest to the proposed facility, located about 1.5 miles away. A neighborhood watch group headed by resident Joe Sopo spoke out against the project, citing fears of people “hidden under the freeways” and that those who are “treatment-resistant” would infiltrate the residences. 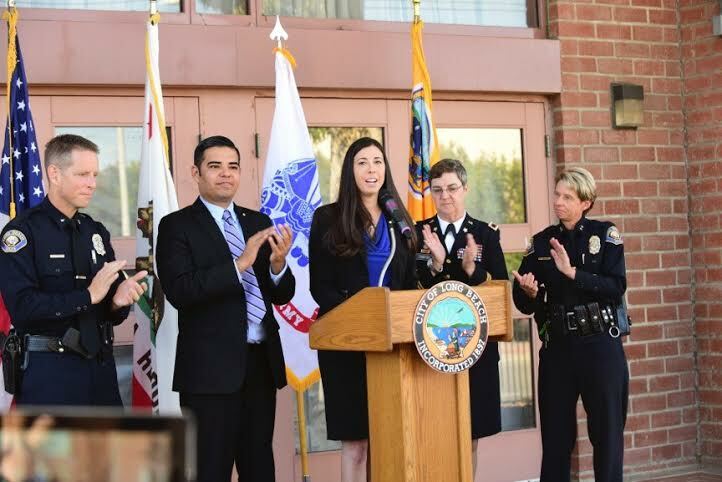 Last March, however, it was decided that the MHA facility would find a new home in the 6th District at a site site adjacent to the Blue Line and less than a block from hundreds of residences that span 20th Street between Long Beach Boulevard and Pacific Avenue. The exchange was a $4M facelift to the building where MHA would be housed. With the title transfer approved, the City will be free to do what it wants with the site—which means a new police substation come 2015. The new substation, according to a statement from the City, will include office space, renovated locker areas, showers, restrooms, and gym facilities, an elevator to provide ADA accessibility, public waiting and reception areas, and a multi-purpose community room. The $5M renovation is expected to be completed by the end of the next year, with $3.5M of the cost fitted by funds from the now-dissolved Redevelopment Agency.